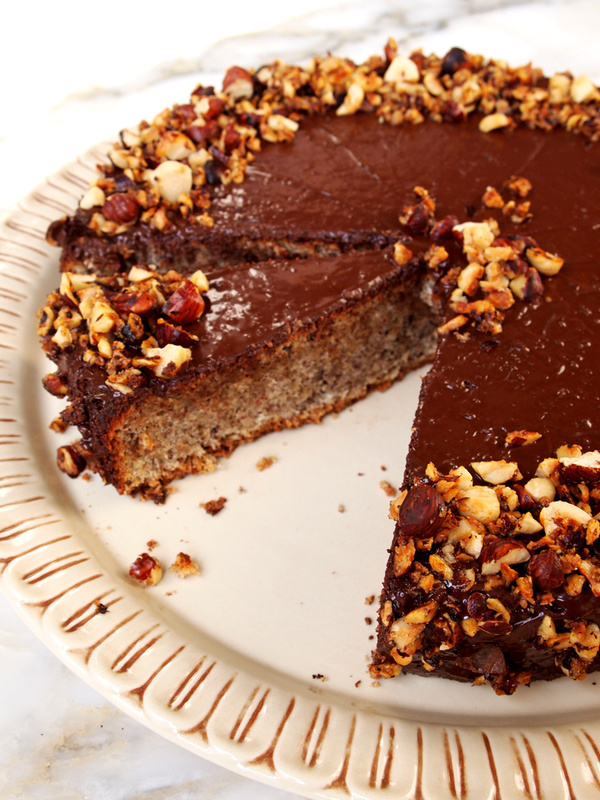 Fourless chocolate hazenut cake! Is this real life? Yes! 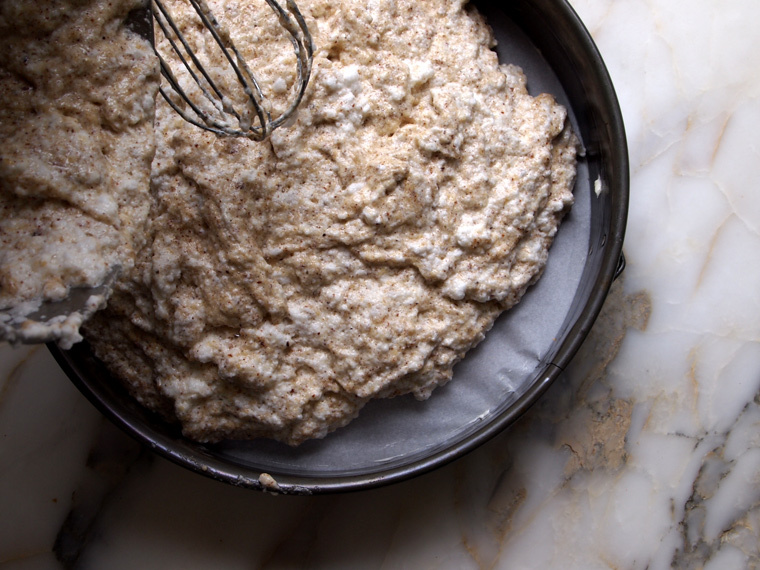 This gluten-free beauty is from my mom’s coveted stash of old-school german recipes. It’s the first time she’s made it since her move to the states – why she waited this long, I have no idea. It’s pretty amazing. 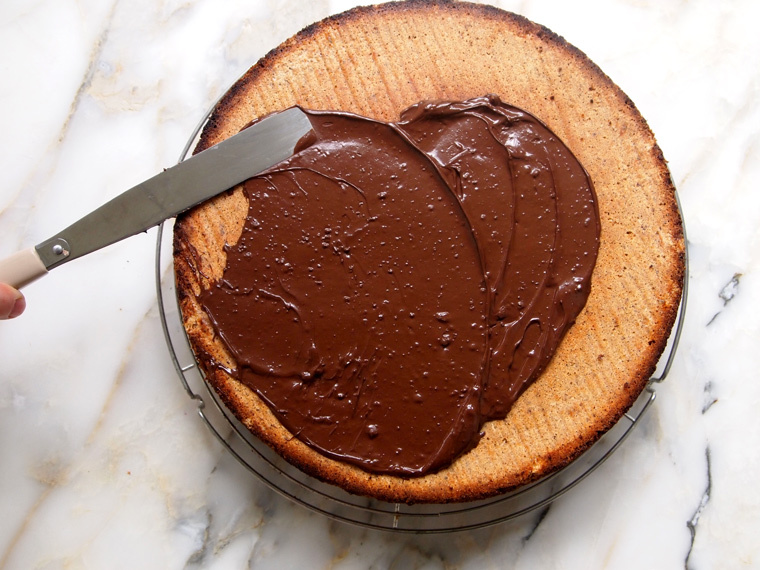 I’m so glad the birth of this cake was documented step-by-step so I (and you!) can make it for years to come. 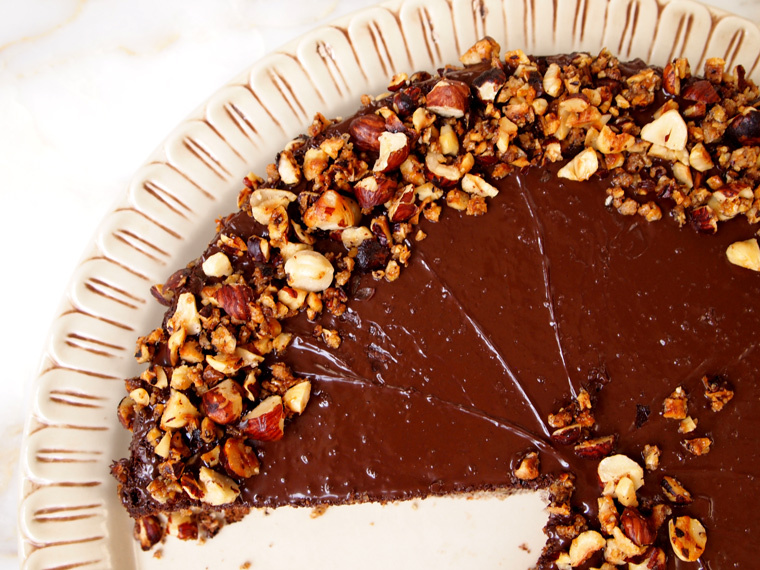 This cake is not too sweet and the hazelnut flavor is through the roof. With just a handful of ingredients the taste is really wholesome and without any butter or oil, you can even eat this cake for breakfast. Yes. Beat 7 egg yolks and 3 whole eggs together with the powdered sugar until you achieve a creamy consistency. 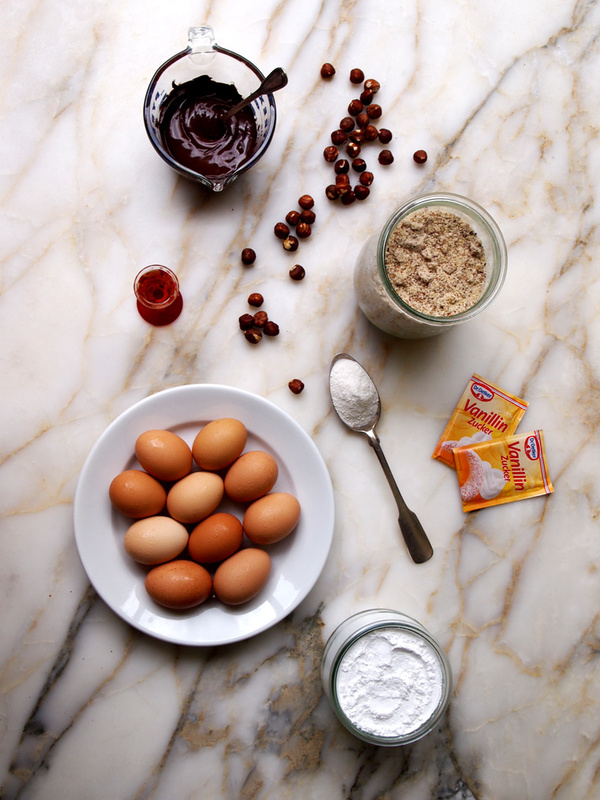 Beat the ground hazelnuts together with the baking powder into the egg yolk mixture. In a clean bowl, beat 7 egg whites to form peaks. Gently fold the egg whites into the hazelnut / yolk mixture. Line a 12 inch springform pan with parchment paper. Pour batter into prepared pan. Let cake cool. Remove pan and parchment paper and cover with melted chocolate and hazelnut crocante. Grind hazelnuts in food processor or you can use hazelnut flour. In a mixing bowl combine 7 egg yolks with 3 whole eggs and the powdered sugar until a cream forms. 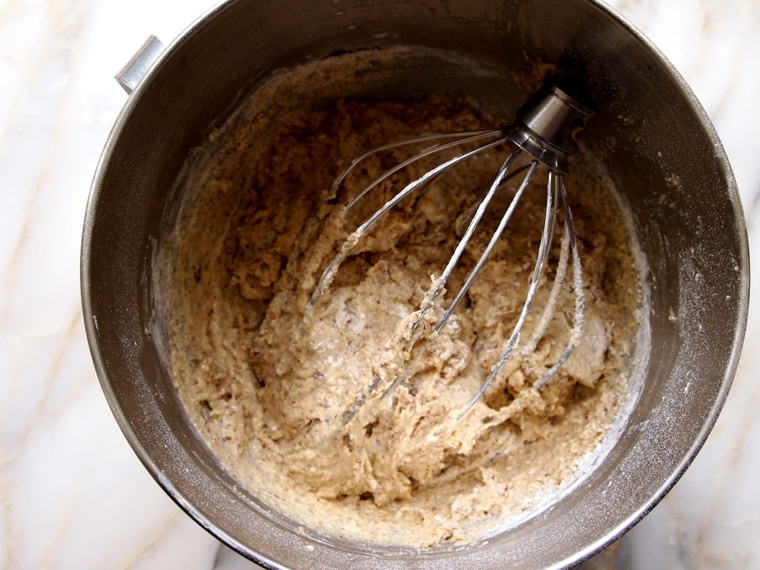 Then add the ground hazelnuts and baking powder and blend again to combine. 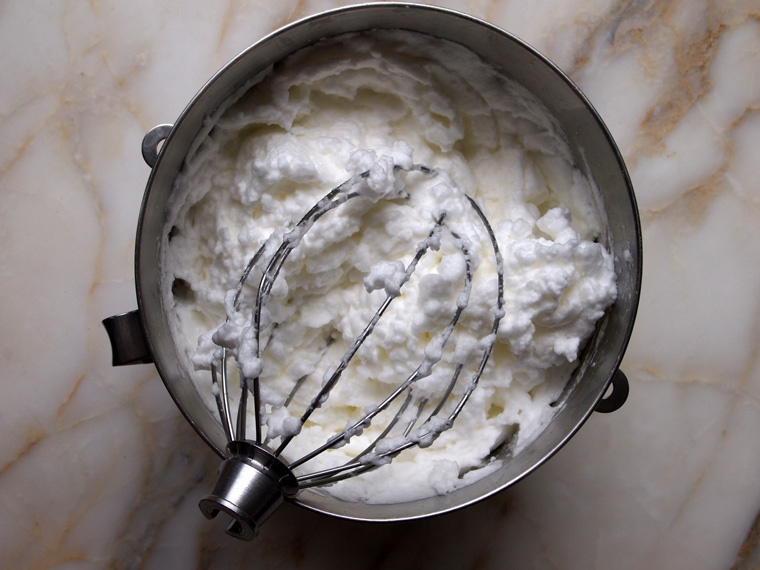 In a separate bowl whisk 7 egg whites to their peaks. 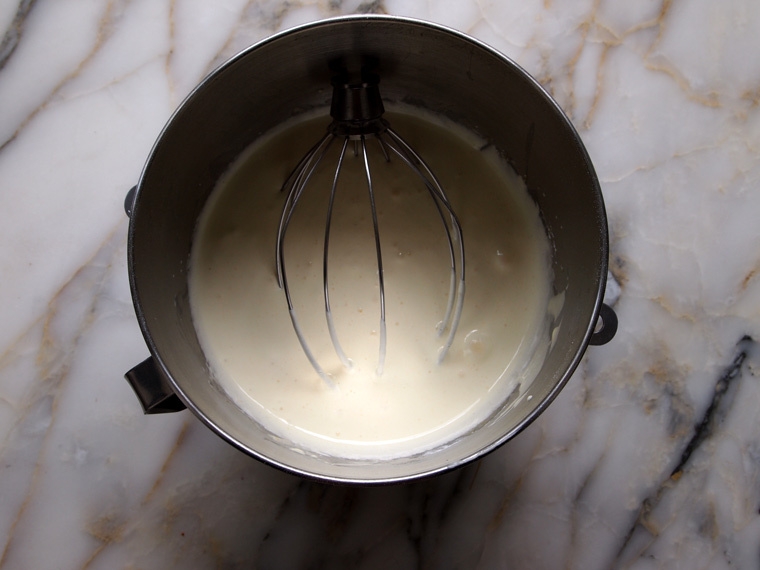 Gently fold the two mixtures together, keeping it light and airy. Line a 12 inch spring form pan with parchment paper and pour the batter into the pan. Bake at 370 F for one hour on the middle rack. While the cake is baking make the crocante. Roughly chop hazelnuts and place in pan on medium heat. 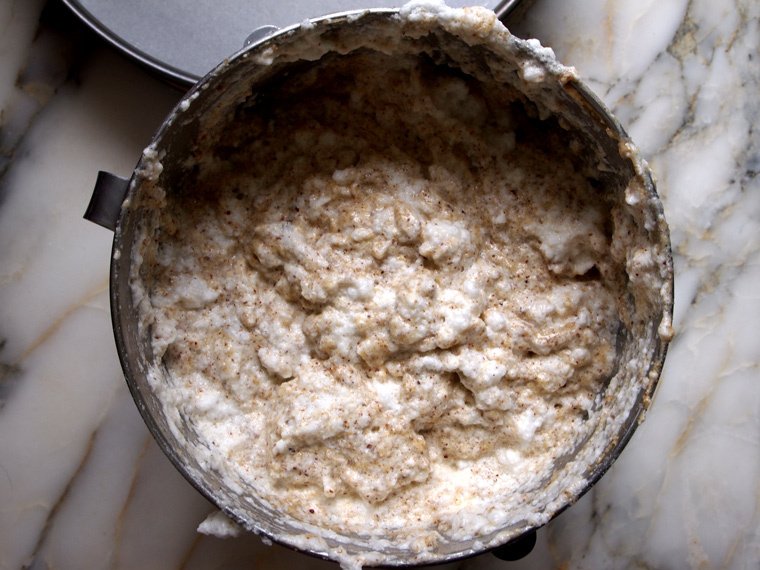 Add a tablespoon of butter and 2 tablespoons of sugar and toast until fragrant. In a double-boiler or microwave melt the chocolate. 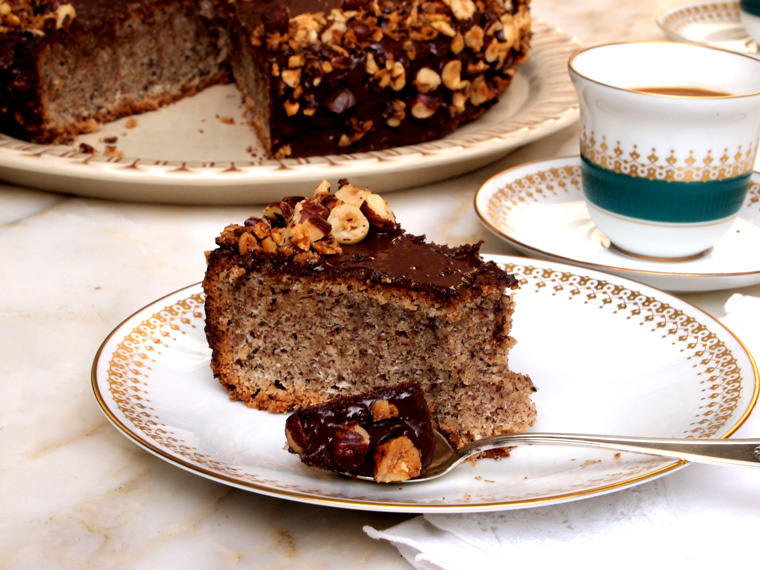 When the cake has cooled pour the melted chocolate over the cake and top with hazelnut crocante. If you like a little brandy flavor you can add a tablespoon of cognac or arrak in the batter when you cream the egg yolks. 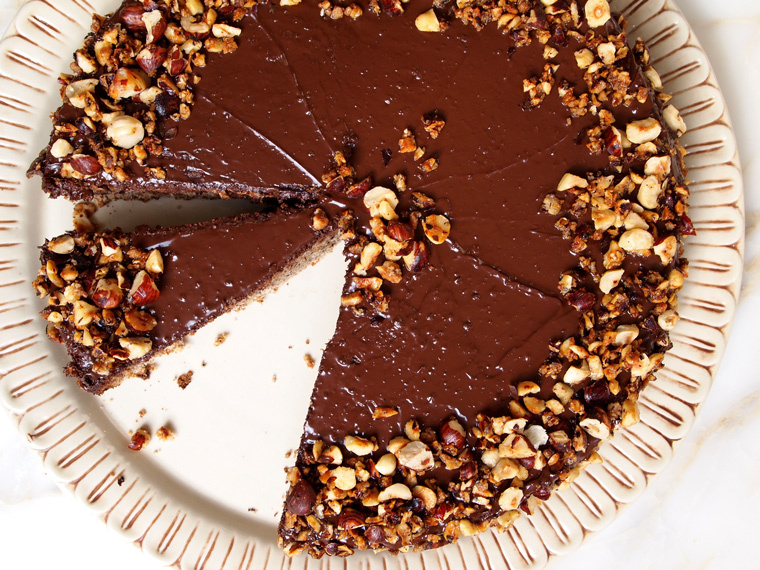 This looks so delicious – and gloriously gluten-free! This is a great recipe for my mum as she can’t eat gluten. Now I have a cake to make on her brithday! Thanks for your comment, Alana. I hope your mother has a wonderful birthday! I made this cake with my mom and we both loved it – I’m sure your mom will too! Thank you Stephanie! You can have a piece for dinner and then another one for dessert! This totally was not what I was expecting but I like that it is “cakey”. The ground hazelnuts make this! Making this tomorrow! I bought all the ingredients. The ground hazelnuts are expensive, so I hope its worth it. It was hard to find hazelnuts for the topping, so instead I might substitute with almonds or crushed peanut butter cups. Oh I’m so excited Elishiah! It’s going to be so worth it! Let me know if you have any questions! I made this for my co-worker and she loved it so much she makes it on a regular basis – but she uses almond flour with almonds on top – so you could totally do that too!